(Mens M) Ugly Xmas Sweater! Fuzzy Teddy Bears Decorating the Christmas Tree! Home > Ugly Christmas Sweaters > Ugly Christmas Sweaters (pullovers) > (Mens M) Ugly Xmas Sweater! Fuzzy Teddy Bears Decorating the Christmas Tree! Ugly Christmas Sweater Pullover! 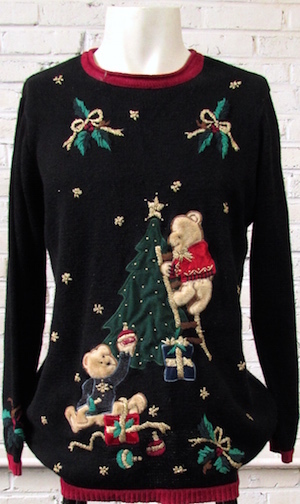 Black knit sweater with two super cute and fuzzy teddy bears in sweaters decorating the Xmas tree! Bears are made of a fuzzy material just like a real teddy bear! Glittery gold accents on the tree, snow flakes and the embroidered holly right above the bears. Each cuff has holly embroidered above it. Collar, cuffs and bottom of the sweater are all trimmed in a magenta knit. Tagged Nutcracker. Ramie/Cotton Blend.